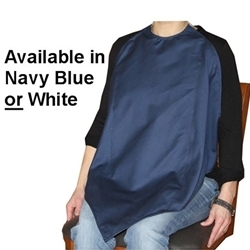 This Spun Polyester Napkin Adult Bib is made using the same material that high quality napkins and tablecloths are made of. The Napkin Adult Bib is meant to keep your clothes protected from food spills. It can also be used to wipe your mouth. 100% Spun Polyester - Material lasts extremely long. Extremely strong long lasting binding. Roll the bib up and put a Napkin Ring on it to dress up the table. Great for wedding receptions (to protect the wedding parties clothing during the meal - embroider the words "Groom" and "Bride" on the bib).